The month of love is here and Mr. Sloto has already spent quality time with Cupid to come up with mischievous winning plans just for you! This February fill your heart with love and your account with wins when you deposit as little as $25 to collect up to a 225% Match + 50 FREE Spins! Cupid is armed with bows, arrows and good luck throughout the month and will help you fall in love with spins and wins! 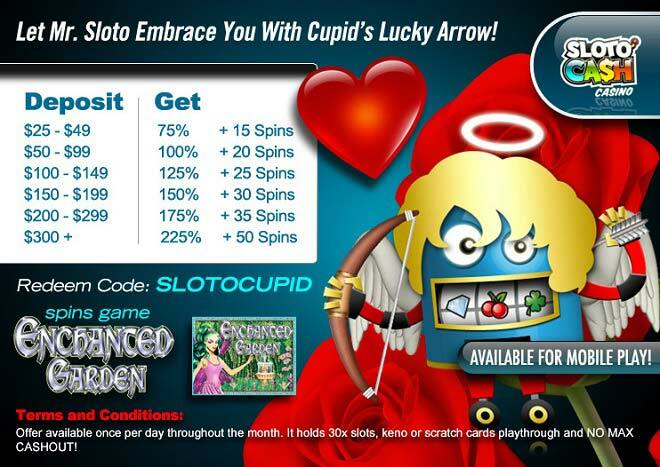 Mr. Sloto and Cupid have teamed up to help you win more with your deposits of as little as $25! Join us for our special Valentine’s celebration all throughout February and get ready to rejoice in your love for winning!